Former Prime Minister Brian Mulroney says other countries will follow Canada’s lead on cannabis legalization, but it will take time. 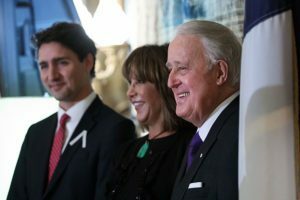 On the same day Canada legalized marijuana for recreational use, Mulroney announced his intention to join the board of Acreage Holdings – one of the largest marijuana companies in the United States. Mulroney – prime minister of Canada from 1984 to 1993 – joins a board already stacked with directors from politics and Wall Street circles, including John Boehner, former speaker of the House of Representatives; IBM’s former chief financial officer Douglas Maine; and Larissa Herda, former CEO of TW Telecom (formerly Time Warner Telecom). In an interview with Marijuana Business Daily, Mulroney and Acreage CEO Kevin Murphy said Canada’s legalization of cannabis sends a signal of social advancement to the rest of the world – and represents a sign of things to come. “It’s a big day in Canada, but it’s also a big day for the rest of the world who are listening. The signal that Canada sends out today will not fall on unresponsive ears,” Mulroney said. Both men expect the United States to take action – sooner rather than later – on changing the federal status of medical marijuana. “When you think about the medicinal value of cannabis, and the fact that the FDA (U.S. Food and Drug Administration) has given approval for a cannabis-derived drug produced in the U.K., I think that legalization of medicinal, at minimum, is probably closer than many think in the United States,” Murphy said. Acreage, a multistate cannabis company based in New York, plans to go public on the Canadian Securities Exchange through the reverse takeover (RTO) of Applied Inventions Management. But Murphy said Acreage is solely focused on business in the United States. “With the 50 states that we have in front of us, 31 of which have a medicinal program for cannabis, we have our work cut out for us,” he said. “The United States is roughly 5% of the world’s population, but we as a country consume more than 80% of all opioids produced on the globe. Mulroney said the world is “on the cusp of an extraordinary period of development, utilization and need” in medical cannabis. The former prime minister wasn’t always so gung-ho about marijuana. During his tenure, Mulroney’s government introduced legislation to keep the plant in the same category as heroin, according to a report from the CBC. But as global perception around cannabis changed, Mulroney said, his position evolved. Nearly three dozen countries have medical marijuana laws on the books. In November, the United Kingdom will become the latest country to allow doctors to legally issue prescriptions for cannabis-based medicines. Wall Street analyst Vivien Azer wrote this week that Canada’s move to legalize cannabis “is the first step” in establishing marijuana as “a key functional ingredient” that will disrupt a group of consumer product categories collectively worth up to $500 billion. Mulroney told MJBizDaily that investors are queuing up to take advantage of a unique opportunity. “This seems to be an opportunity for redemption by governments toward their citizens, on a par that is rarely equaled,” he said.